The root letters of the third column appear according to their Wylie-equivalent, i.e. with a voiced letter. pha and tha lose their h → pa and ta. This applies to Sanskrit words, too. However, in the case of established names or terms they can occur in the Translation Phonetics. The postfix ba is written as a b, also when it is followed by a second postfix sa. B is used instead of p to avoid the appearance of a double pp when the syllable pa is added to a word. The postfix ga is written as a k, also when it is followed by a second postfix sa. The vowels a, o and u become e or é, ö and ü when followed by the postfixes: da, na and sa. Da and sa are themselves not pronounced, but na is. The combination da + ba becomes wa. All combinations with a subscribed la are written as la. Only zla becomes da. A subscribed wa has no influence and does not lead to any change in phonetics. Superscripts do not lead to a change in phonetics. Sometimes the superscripts of the second syllable of a word are pronounced. This might need to be adjusted manually, maybe also in dependence of the recording. Generally prefixes do not lead to a change in phonetics. However 'a and m as prefixes of the second syllable of a word often form a nasal sound. This might need to be adjusted manually, maybe also in dependence of the recording. There are also a few cases where other prefixes are pronounced. The particles pa, ba, ma, po etc., forming the second syllable of a word, are to be added to the first syllable or word. This is also the case when a connective particle ('i) is added to the second syllable. When an agentive particle is added. When an adverbial r is added. Ba or bo, when being a second syllable, become wa or wo. With the vowel signs e, u or i they remain a voiced be, bu or bi respectively. Accents above an e (é) are to be used when the danger exists that the e might not be pronounced correctly. This is especially the case at the end of a word. These cases might need individual checking! Names are not to be written with accents! This is not the case when bral is associated with more than one previous word. word + ma (when forming one word) → wordma. This needs manual adjustment. negation (ma, mi) + word → negationword. Only when the phonetic version of the following syllable begins with ng, negation and the following syllable are written separately, as a mispronounciation could occur otherwise. Weak syllables preceding a word are generally attached to words consisting of one or two syllables. If a weak syllable, except for pa, ba, ma etc., is followed by another weak syllable, the strong syllable should remain alone and the two weak syllables should be joined. When a syllable is followed by a particle pa, ba, ma etc. which again is followed by a weak syllable, all three can be written together. When a syllable is preceded by a negation and followed by a weak syllable, three syllables can be written together. The verbalizers byed/mdzad (and their different tense forms) are added to words consisting of one or two syllables, if they do not make up a word that is too difficult to decipher. When adding any (weak) syllables it is important to pay attention to the new appearance. If it gets too long and/or too difficult to decipher, it would better to separate the weak syllable from the rest. There are words that optically consist of only one syllable while their pronunciation is that of two. In order to avoid the usage of an apostrophe, the two syllables are separated. In the same way the completion particle 'o is kept separate from the word it is optically associated with. e.g. skyabs su mchi'o → kyab su chi o. When two syllables are preceded or followed by a weak syllable, and this includes weak syllables in combination with an agentive particle, connective particle etc., three syllables can be written together. When three syllables make up one word, the two first ones can be written together, the third separately. When syllables form a word or a set phrase in English they can be written together. If the syllables are short (like rin po che) three syllables can at times be written together (rinpoche). But usually in the case of three (or more) syllables it is less recommended since it can be difficult to decipher (like ngayabling). In such a case the first two syllables could be joined and the third is written separately (ngayab ling). Except for some cases of commonly known terms the combination of the phonetic form of a syllable that ends with an n and another that begins with a g should be avoided as it is not clear whether to pronounce the combination of the two letters as nga, like the letter nga in the alphabet, or as n-g. In that case the n would mark the end of the pronunciation of the first and the g the beginning of the second syllable. e.g. kun dga' is to be pronounced as kün-ga but could mistakenly be pronounced as künga; bco lnga (15) is to be pronounced as chonga but could mistakenly be pronounced as chon-ga. In the same way the phonetic combination of k and n should be avoided. It could mistakenly be pronouced as a kn-sound. e.g. smug nag should be be phonetisized as muk nak instead of muknak. But if a word is commonly known it could be joined. Numbers consisting of two syllables are to be written together. An ordinal number consisting of three syllables (+ pa) is to be written together. e.g. bcu gnyis → chunyi, sum bcu tsa gsum → sumchu tsasum. Due to general established standards there are sometimes two ways for writing a word: One corresponds to rules of phonetics (practice book phonetics), the other is the way in which a word would appear in the translation (translation phonetics). Some established words, for which there was no consistent phonetic representation, are now written according to their actual pronunciation. 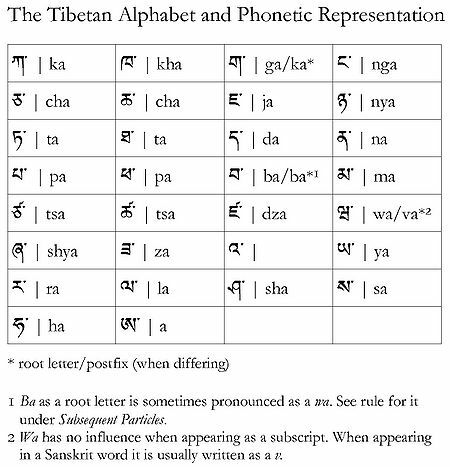 The usage of Sanskrit diacritics: No diacritics are used for practice books phonetics, but they are used when a term or name appears in the translation. Practice materials and publications for advanced students will contain Sanskrit diacritics. A very brief introduction explains the usage and the pronunciation of Sanskrit letters and diacritics. ↑ For all examples the Wylie-system of transliteration is used. ↑ See rule under Practice Book Phonetics vs. Translation Phonetics. ↑ Weak syllables are: pa, pas, pa'i etc., ldan, bral, can etc. ↑ Because ma can precede a syllable as a negation and can form certain words as a subsequent syllable, rules cannot be applied automatically to the online tool for the creation of phonetics. This page was last edited on 30 April 2014, at 10:37.